"Cocoa Daisy has done some remodeling and updating, making our home a place you want to be. Drop in and see how our scrapbook home is your scrapbook home too. To help celebrate, we are doing a blog hop and giveaway. Just leave a comment to be entered to win a $10.00 Cocoa Daisy Coupon. 1.Sign up for a 6 month kit subscription and you will receive 20% off your first month's kit. 2. Sign up for a 6 month kit AND a 6 month stamp subscription and you will get 20% off your first month's kit and stamps PLUS an exclusive Cocoa Daisy Tote bag." How fun is that? Cocoa Daisy's kits are so awesome! They are always filled with the latest and greatest. And they have the cutest stamps. You can even subcribe and get the stamps on their own. How cool is that? 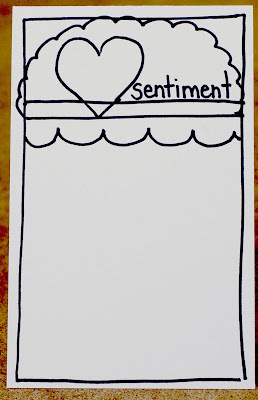 So, to celebrate we were each asked to create a card sketch. Now, I stink at making sketches. Some people go all techno and I have no clue how to do that. So, you get this lovely sketch done with a Sharpie and some cardstock. Now, I CAN make cards. So here is the card I made from the sketch. I used Crate's Paper Heart collection on here. The sticker and chipboard heart are also Crate. Now for the fun part - a giveaway! I have a $10 Coupon to Cocoa Daisy up for grabs. All you have to do is lave a comment by 8pm on Sunday to be entered. Be sure to hop around to all of the other blogs for loads of inspiration and for more chances to win! Here's a list of all of the participants. And don't forget to visit Cocoa Daisy!! What a sweet card! Thank you for the inspiration....isn't Cocoa Daisy simply the best? Thank you! This is gorgeous, Anabelle! Just like everything else you make! I love all the treasures on your card - so sweet. Well I just love your sketch and I think it looks great hand drawn!!!! And what a gorgeous card! Such an awesome sketch! I might have to give it a go too. Especially now that I've seen your gorgeous take on it. I love your monochromatic colour scheme. Beautiful cards with those pefectly matched pink shades. SO pretty! Love your card! oo your card is gourgeus! Annabelle, this card is perfectly sweet and lovely! You make sketches the same way I do, lol! so beautiful card. thanks for sharing. Your card is beautiful... I am hopping onto the next site. Beautiful card- it looks angelic with the light colors and lace. Wow, love how your card turned out. It's lovely. Gorgeous Card! Love the sketch too! What a simply sweet card. I adore this! Your card is just beautiful! I love your style!! So many wonderful elements going on! Thank you for the inspiration! What a beauty you created in that card ... i love it!! All these card sketches are opening up a whole new set of ideas for me! That is a beautiful card! So digging all that pink! Thank you for the chance to win. I think your sketch is just fine; the important thing is to get the design across and you do. I love the card you made too. Great card. So pretty. Thanks for the opportunity to win. this is so beautiful a delicate feeling...love! Such a beautiful and feminine card. Great card! Love all the little elements you put together for this! I love the way you used that doily! Thanks for the chance to win that gift certificate! I love that lace border! And the ticket! Two things I'm totally into right now. Thanks for the chance to win! Wow what a cute card! Love the paper! Love the pink! Thanks for the chance! Beautiful card! love the soft simplicity of it! And I was lurking around your beautiful blog and just had to say I love your paper braiding technique, too! What a sweet, feminine card. Like all the darling embellishments! Love the colors and all the sweet little elements in your card! TFS! This card is so pretty and delicate. Love it! Thanks for a great hop! You did a great job with the sketch & your card is beautiful. Thanks for the chance to win. I love your sharpie sketch. it's perfect. So pretty and girly! Such lovely details. tfs. I love the femininity of your card. Simply gorgeous! This is such a lovely card! I love the 'softness' of it. oooh what a very pretty card! Your card is just beautiful! This is so, so pretty!! Your card is wonderful and the sketch is just what it should be..a sketch! Love the delicate look of this card!! Just beautiful!! Art! It is cool! And love the giveaways, too!!!! Thanks! Your sketch is perfect and I love the card you made from it. So sweet! I love the card, and I love how soft the ribbon makes it feel! yes you can make cards because that one is absolutely lovely! Your card is so pretty, I love the pink and the papers. That is the most beautiful card. Do you need my address?! WOW! I think your sketch and card are fabulous! Love all the details and sewing! Thanks for the chance! Can't wait to get the March kit! You did a great job! I love this card it is so sweet! Thanks for the chance to win! Oh, your card is so girlie and pretty! Loving all the little embellishments and sweet colors! Anabelle...I love your Sharpie sketch! You can also make a beautiful card girlie! Thank you for all you give us and Cocoa Daisy! Such a cute card!!! !You are simply wonderful and inspiring!!!! I almost forgot to come back here and leave a comment bc I was surfing your site.. such great work.. This is a very romantic one! Gorgeous card. Make me wish I had a wedding to go to to give it away. I am in love with that pretty pretty card! Cocoa Daisy's new look is wonderful, very organized yet cozy too! Thanks so very much for an opportunity to win these stamps - I'd so love to have them! You've brightened my weekend! Oh my.... pink, doilies... just luscious! Lovely card! Thanks for the chance to win! Beautiful!! Love the soft colors. Such a pretty pink card!! What a stunning card! I'd love to give at with a wedding gift. Your card is so lovely and feminine! Your sketch looks like my sketches. The most important thing....your card is BEAUTIFUL! Wow! Your card is beautiful! 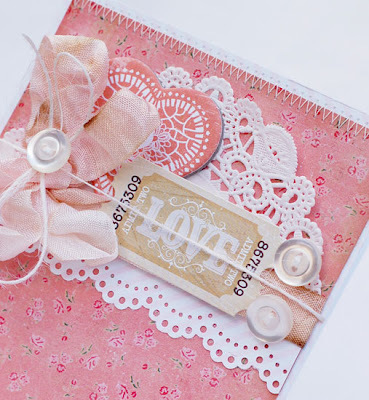 I love the soft colors and all of the embellishments that you used. Thank you for the chance to win! 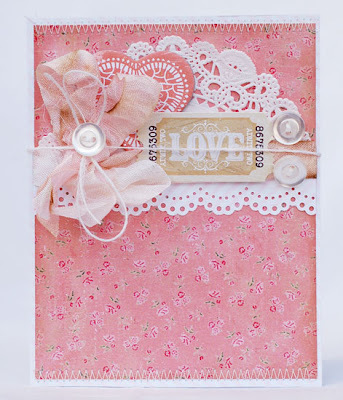 LOVE your soft, gorgeously layered card! 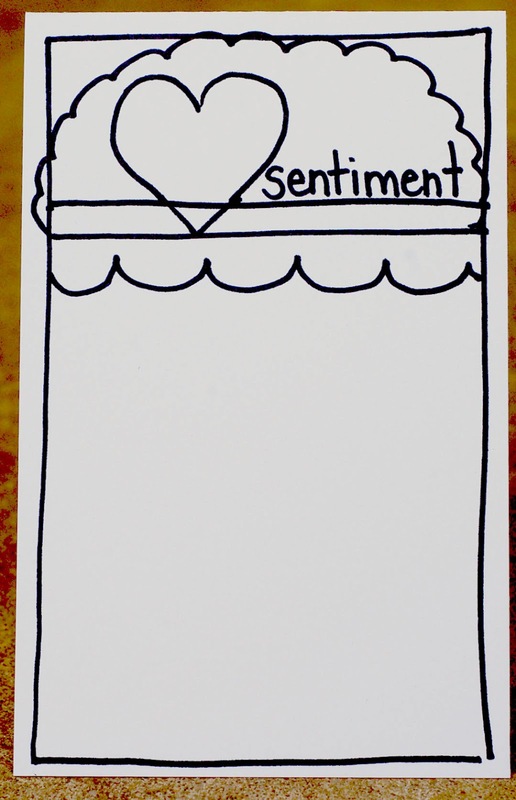 I love your Sharpie & card stock sketch! That's what all of mine look like :). Beautiful card... I love the doily and the chipboard heart! Your card is so beautiful! Love it! your card is just gorgeous! I love the stitching and would love to incorporate it into my cards, but have yet to do it. now I found yet another way to do it, thanks for sharing :) thank you too for the chance to win! Your card is sooo pretty. i love the pink. Love your little sketch, Anabelle! Cute card too.